Not all who wander are lost. But some percentage of those who wander are lost. And it’s probably not a small percentage either. Getting lost in the woods is a way of life. Antioch College, where I earned my psych degree, faces a 500-acre nature preserve, Glen Helen, which a lot of people consider a sort of hotbed of magic. Whether it is or isn’t, I spent a lot of time wandering around there, getting deliberately lost so I could find my way out again. As a result, I know those woods very well, well enough to walk around them in the dark and know where I am. You could probably drop me in them now, almost 20 years later, and I wouldn’t have any trouble getting out again. I used this same technique to learn how to navigate in Chicago when I moved there after college. Even though I grew up in the north suburbs, we rarely visited the city, and when we did it was typically to very specific destinations, usually with detailed instructions. When I lived there as an adult and got irritated with the traffic, I would simply find some other way. Yes, I got ridiculously lost all the time, but after a couple months, that didn’t happen anyway. When I thought I was lost, I would suddenly realize that I had been lost in this exact place before. All I had to do then was remember how I found my way out the previous time. Now I have The Man, whose sense of direction is unerring, except for this one time that the VA prescribed him a very powerful headache medication and he became disoriented in an IKEA parking lot. Typically, though, he can look at a map and recall all the salient features, even in a city he’s never visited before. Seriously, I’ve probably flown into Miami-Dade Airport over 30 times in my life, and the idea of renting a car and driving myself out of there is terrifying. The Man not only tackled this task with no anxiety, he also refused to pay extra for the SunPass and managed to drive us all over the state without ever once getting on a toll road. He can drive from my dad’s cousin’s in Coral Gables to my mom’s sister’s in Boca Raton without even thinking about it. At least that’s how it looks. He does have GPS, so I could be wrong about the extent of his abilities. 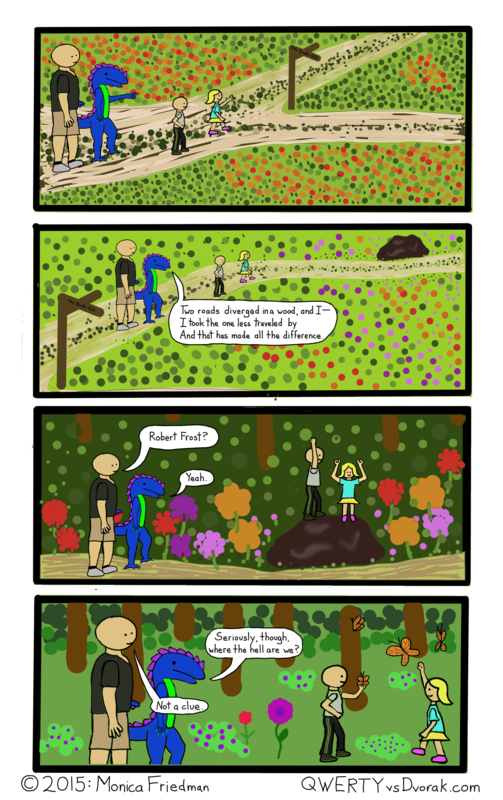 This entry was posted in dragon comics and tagged comic, dragon, kids, lost, poetry, robert frost, woods on April 29, 2015 by littledragonblue.